When does a headache need to be seen at the hospital? A headache is considered to be pain located anywhere in the region of the upper neck or head. It is one of the most common locations of pain in the human body and can have many difference causes. There are three major categories of headaches which include primary headaches, secondary headaches, and cranial neuralgias which can be associated with facial pain. Primary headaches include tension, migraine, and cluster headaches. Secondary headaches are those due to something affecting the underlying structure of the head and neck. Causes include bleeding in the brain, tumors, meningitis, and encephalitis. The third type of headaches which involve neuralgias and facial pain are usually caused by inflammation of the nerves in the head and neck. Tension headaches are the most common type of primary headache and are more common in women than men. Their cause is unknown but thought to be due to the contraction of the muscles covering the skull. Tension headaches usually occur because of physical or emotional stress placed on the body. Symptoms of a tension headache include pain which is described as “tightness” that begins in the back of the head and upper neck. It is usually mild in intensity, bilateral and not associated with vomiting or sensitivity to light. Usually, these headaches do not impair function. Migraine headaches are the second most common type of primary headache and are also more common in women than men. They are associated with unilateral headache, nausea, vomiting, and sensitivity to light. 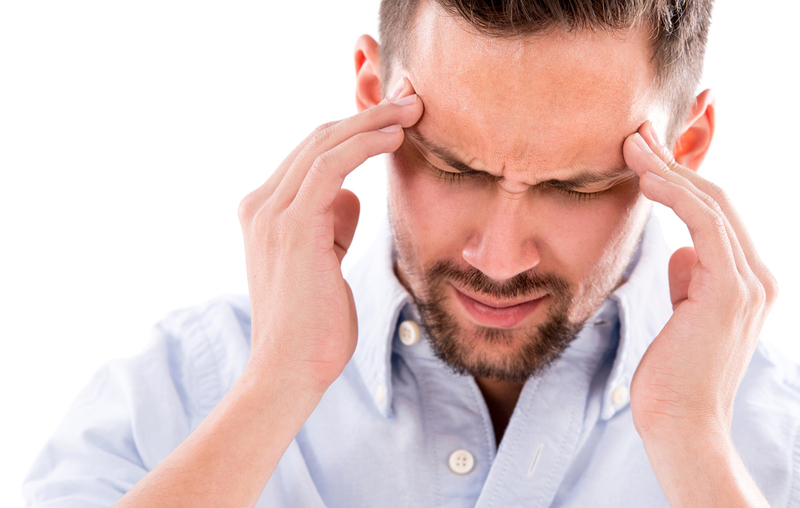 Cluster headaches are rare primary headaches and occur more commonly in men than women. The cause of cluster headaches is unknown. They tend to run in families, which suggest genetics may play a role. They may be triggered by changes in sleep pattern and by certain medications. Symptoms of a cluster headache include unilateral pain in the face and head that is sharp in quality and very short in duration. The pain is usually excruciating and the eyes and nose may become watery. Secondary headaches include causes such as head and neck trauma, blood vessel problems in the head and neck (ruptured brain aneurysms fall into this category), non-blood vessel problems in the brain, medications, infection, and changes in the body’s normal environment, problems with the structures of the head, and psychiatric disorders. Headaches are treated differently depending on the type, cause, and nature of the headache. Tension headaches are usually treated successfully with medications such as aspirin, ibuprofen, acetaminophen and naproxen. If these fail, supportive treatments should be sought out such as massage, biofeedback, and stress management. If mild, migraine headaches are usually first treated with non-steroidal anti-inflammatory agents or NSAIDs. The drugs of choice for migraines are considered to be triptans such as Imitrex, Maxalt, Amerge, Zomig, Axert, Frova, Relpax, and Treximet. Some other medications used include ergots, anit-nausea medications, butalbital combinations, and opiates. Cluster headaches are usually treated with inhalation of high concentration of oxygen, injection of triptan medications, injection of lidocaine, ergotamines, and caffeine. Preventative medications include calcium channel blockers, prednisone, lithium, and valproic acid. When should a headache be treated? A patient should seek medical care it for a headache when it is considered the “worst headache of his/her life,” different than a usual headache, starts suddenly or is aggravated by physical exertion. Medical care should also be sought if the headache is associated with nausea and vomiting, fever, stiff neck, seizures, trauma, changes in vision, changes in speech, changes in behavior, weakness, is getting worse, and/or is disabling. Why should a headache be treated? A headache should be treated because it may be caused by something serious or be associated with a worsening condition and if left untreated may even lead to death. Headaches should also be treated so that it does not become disabling and impair normal function. Overtreatment should be avoided due to the fact that some medications, once stopped, may cause rebound headaches. So, to answer my simple original question, “When is a headache more than just a headache?” with a simple answer; any headache that presents with neurological deficits and is different than a usual type of headache that you suffer, requires medical attention. Chaim Colen is a neurosurgeon. He can be reached on Twitter @MyNeurosurgeon. Next post > How can anyone deny scientifically sound treatment for breast cancer?